More health professionals than ever before are incorporating mobile devices and applications into their practice, but both virtual and biological “bugs” create vulnerabilities that may put patient accessible data on these devices – including the patients themselves – in danger. Beyond data protection methods like anti-virus software; hand washing and other sanitization procedures are needed to combat the perpetual buildup of pathogens on these devices. In a recent study released by the Security Research team at Hewlett-Packard (HP), a review of 2,107 applications, or apps, offered by 601 companies listed in the Fortune Global 2000, reported 97 percent of the mobile apps tested had accessed at least one source of private information from the mobile device. The researchers also found that 86 percent of those apps lacked the security measures necessary to protect the applications from the most common cyber threats. These apps are increasingly mission critical to important business and personal functions. This makes the protection of vulnerable mobile device and app users targets for attack, worthy of proactive strategies to secure the sensitive data stored on the device. 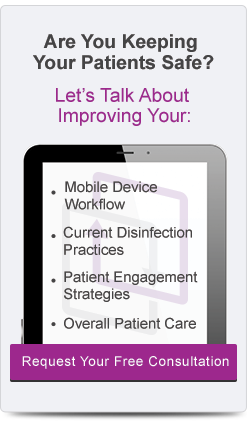 The use of mobile devices has exploded in the past few years, especially in healthcare. The American Association of Nurse Anesthetists says that 50 to 60 percent of physicians and residents use smartphones to access clinical apps. In the feverish pace that software engineers employ to keep up with demand; pushing the technical envelope can sometimes create unknown vulnerabilities and even neglect to implement even the most basic security. Hackers and other computer adversaries take advantage of security flaws to create entry points, where they can access critical information housed on mobile devices. In the HP study, the researchers reported the most common and most easily addressed threats. Privacy issues were the most common – the report showed 97 percent of apps studied accessed private data sources, such as social media pages, personal address books, and connectivity options including Bluetooth and Wi-Fi. 86 percent of these apps lacked the security measures necessary for protection from the most common exploits, including insecure transmission of data and misuse of unencrypted data. Furthermore, more than three-quarters of all mobile device apps studied lacked proper encryption techniques to store data. It is relatively easy for attackers to access unencrypted data, including passwords, personal or patient information, trade secrets, documents, photos and other information. 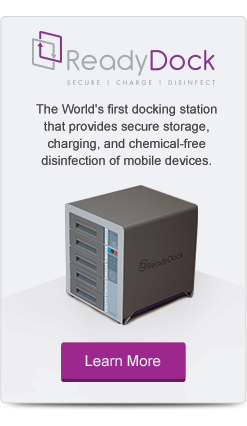 Mobile devices can also spread pathogens. Researchers in one study asked 40 anesthesiologists working in an operating room to use their personal cell phones to make a short call. After the call, the researchers identified bacterial contamination in 38 of the 40 study participants. While mobile devices and apps are becoming increasingly essential for today’s practitioner, these devices can also leave the clinician, patient and device vulnerable to attack. Dana Carter, PhD is an academically trained, experimental neuroscientist. Currently, Dana is a science writer who focuses on different aspects of psychology, physiology, and overall health and wellness. Prior to her current role, she spent a combined seven years researching the genetic components of mental illnesses, and the effects of drugs and alcohol on fetal brain development. She received her PhD in Neuroscience from the Texas A&M Institute for Neuroscience and her B.Sc. in Psychology from Texas A&M University. She enjoys traveling, writing, and promoting learning about healthy, active minds and lifestyles. "HP Research Reveals Nine out of 10 Mobile Applications Vulnerable to Attack"
"Bacterial Contamination Of Anaesthetists' Hands By Personal Mobile Phone And Fixed Phone Use In The Operating Theatre"